In this model, the agonist and modulator-bound receptor complex has the potential ability to signal; therefore, p refers to the change in the efficacy of the agonist when the receptor is bound by modulator (p = t'/t where T is the efficacy of the agonist when the modulator is bound to the receptor). This permits the model to predict a range of separate effects on affinity and efficacy of the agonist. While orthosteric effects are preemptive (once the antagonist binds, no effect can be produced by the agonist) whereby there is never a species of protein with both agonist and antagonist bound, allosteric effects are permissive. This latter property means that there are protein species with agonist and antagonist co-binding simultaneously. Under these circumstances, the antagonist (actually more specifically, allosteric modulator) can change the receptor reactivity toward the agonist in a number of ways, that is, ranging from increased to decreased affinity, increased to decreased efficacy. Moreover, these effects can be probe dependent, that is, be different for different agonists  . This can lead to interesting effects such as that seen with the N-methyl-D-aspartate (NMDA) receptor antagonist ifenprodil  . This drug reduces the efficacy but increases the affinity of the receptor for NMDA; under these circumstances, ifenprodil potency, as an antagonist, increases with increasing concentrations of NMDA; that is, the antagonism increases as the system is more highly driven. 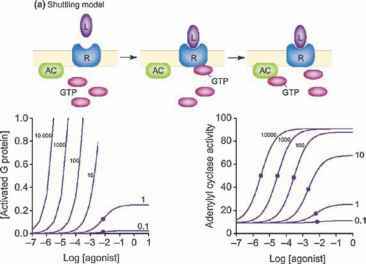 These models of receptor function can be used to characterize agonist and antagonist action using null methods with no knowledge of receptor structure or biochemistry required; that is, the receptor can be viewed as an operational on-off switch. While this was imperative in the early years of receptor theory where no mechanism-based knowledge concerning receptor function was available, the last 20 years of technological advancement has furnished a wealth of information about the structure and function of receptors. This has added greatly to the understanding of drug and receptor function. It is worth considering how knowledge of receptor structure and biochemical function has added to the models used to describe and predict drug action.